Operating out of the historic, Lymefield Mill, in Broadbottom, England, Tiviot Prints is one of the UK’s leading textile printers. Printing textiles using a range of traditional techniques and cutting edge, digital equipment, our team has both the expertise and creative energy to deliver everything you need for your next textile print project. Whether you need a limited run, bespoke textile designs or thousands of metres of the highest quality fabric, Tiviot Prints can make your textile vision a reality. When you need a high degree of colour accuracy and a large quantity, there's no better option than a screen print. We can colour seperate your design, engrave screens and add a great variety of finishes, such as tinting, shower-proofing and fire proofing. 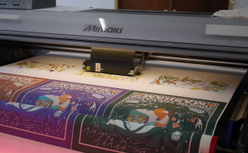 If you require a short run or a highly complex design, then digital printing is the answer. With no minimum order and no restriction on the number of colours, we can reproduce your designs or images to the highest standards. Digital gives a fast turn-around with exceptional definition. 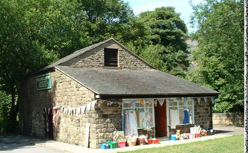 Our mill shop specialises in selling printed fabrics, off the roll, direct to the public. We sell various fabrics and designs that are printed here in the UK at Tiviot Prints. We sell direct to the public at better than high street prices, so why not pop down, to see what all the fuss is about?